Older brothers, man. They torment you when you're a kid, and you think it'll end when you're adults - but no, because then they're uncles who torment you via your own children. When we moved to Ohio, my brother Steve and his family moved here too, and it's great having them around. We live really close to an amusement park, and every single Saturday, without fail, he takes one of the boys there. This past Saturday, it was my five-year-old's turn, and he was excited about his "Corbin-and-Uncle-Steve-time." Early that afternoon, after they'd spent several hours at the park, I texted Steve to tell him that we were getting ready to go somewhere and we'd swing by to pick Corbin up (side note: he used to call himself "Bun" instead of Corbin when we were little, so that's who I'm referring to). I wanted to make sure he went to the bathroom to avoid this type of situation. Here's the text exchange that ensued, my brother being his normal brotherly self. Ha ha. Very funny. DORK. So anyway, a few minutes later we pulled up in my brother's driveway, and Corbin runs to the minivan excitedly waving a white styrofoam cup. 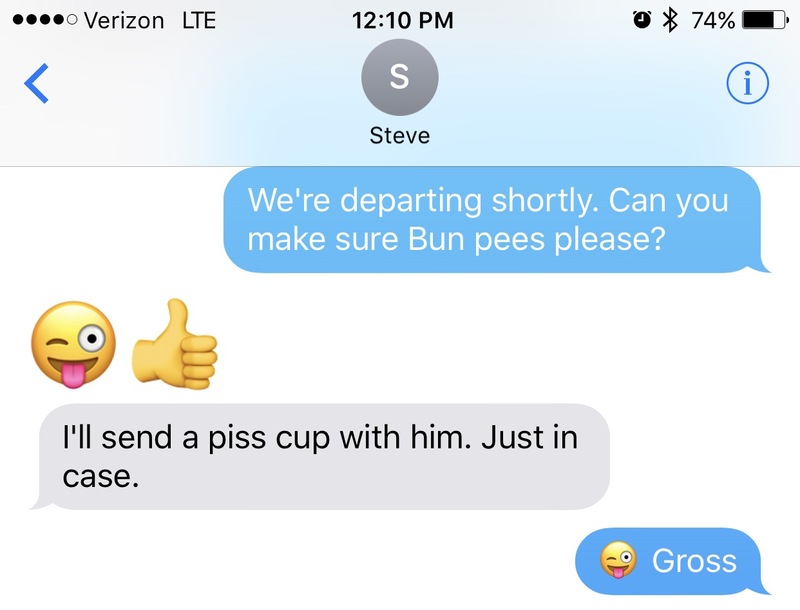 "I've got a piss cup!" he exclaimed proudly, as though it were some sort of grand prize. My brother, of course, was cackling. Don't you just love how the beams of light are shining down on it, like it's some divine chalice? He asks about it first thing when he wakes up, and has to know its exact location before going to sleep at night. 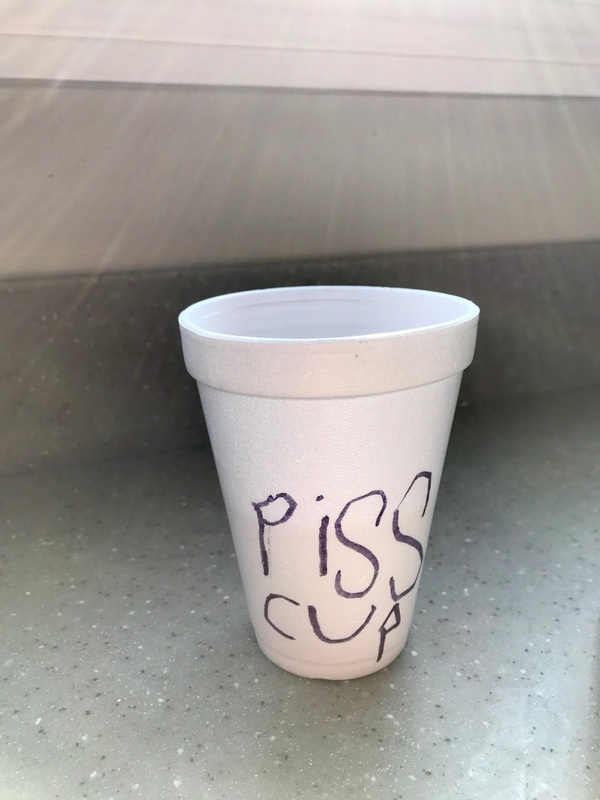 He made up a little ditty which he sings softly to himself, "Piss cup, piss cup, oh I love my piss cup!" To date, he hasn't actually used it for piss, but let's just say I won't exactly be surprised if one day I find it used for its intended purpose. Grossed out, for sure, but unsurprised. The other night we were in a restaurant and the elementary-aged kid in the booth behind us jokingly ordered a Budweiser. My husband Curtis, who always overhears (okay, unabashedly eavesdrops), let out a chuckle. "That kid just ordered a beer." "Um, our kindergartener has a piss cup," I countered. He raised an eyebrow and gave a slow nod. "... Indeed he does."